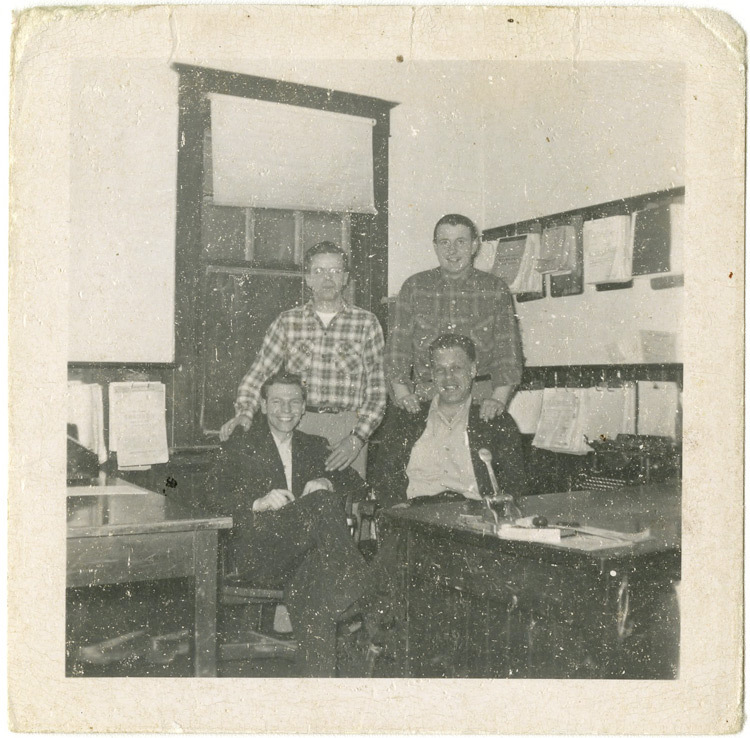 Researching a black-and-white photo can lead to the discovery of colourful stories! 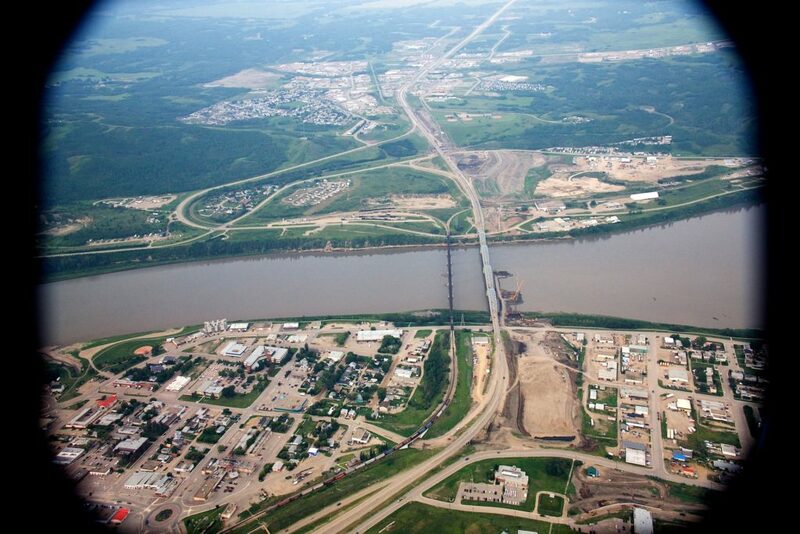 November 2018 was the 100th Anniversary of the completion of the railway bridge across the Mighty Peace River. I collaborated with Carson Murphy and Beth Wilkins at the Peace River Museum to create a commemorative “Peace Train” card with pictures inside and a story on the back. While doing research for the story, I found tucked away in a file, a yellowed newspaper clipping containing such a great story, I felt compelled to pay the licence fee to Postmedia Network for the right to republish it. I hope you enjoy reading and sharing it. 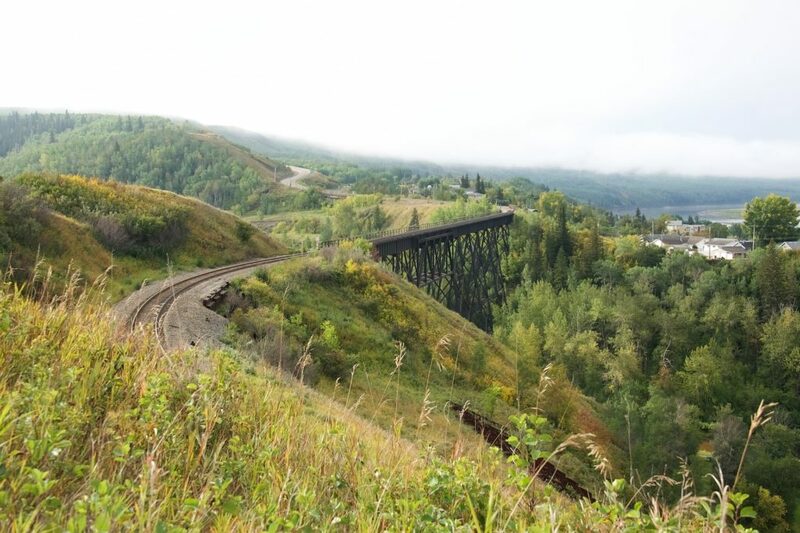 This little-known bit of Peace River history is narrated by a Calgary Herald columnist as a comedy of errors that led to greater safety for people using the train bridge when it was the only bridge in town. 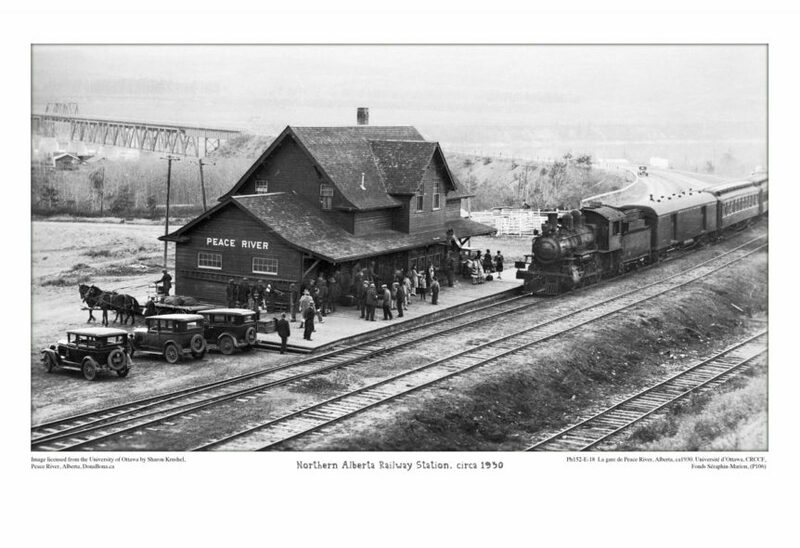 PEACE RIVER – No railway station, anywhere, has seen so much traffic going back and forth as did the Peace River depot the day the caboose ran away. MR. MacARTHUR accepted the compliments about the railway and extended his own to the town but simply smiled vaguely over reference to the funny thing that had happened to the caboose. There wasn’t much else he could do because he had not heard of it but he made a mental note to find out just what was so funny about it. 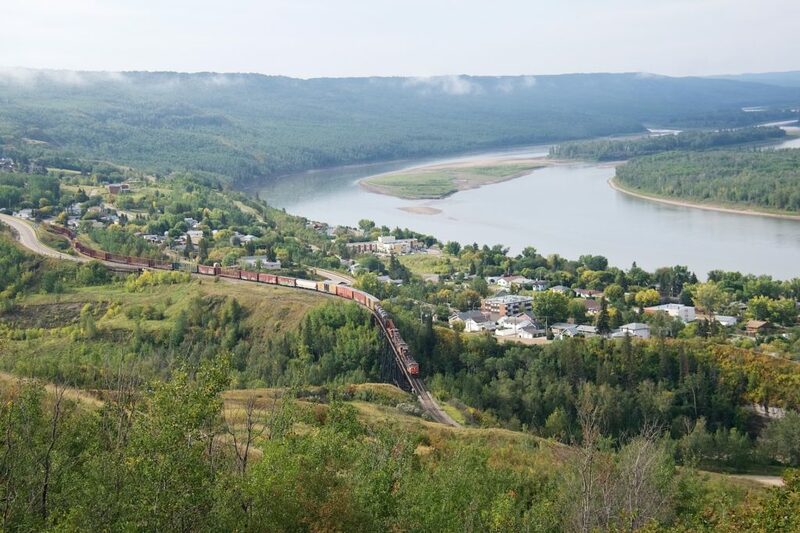 The town of Peace River, which now has a population of 5,300, nestles on the river of the same name. Rivers have banks and where there are banks the railways have grades. 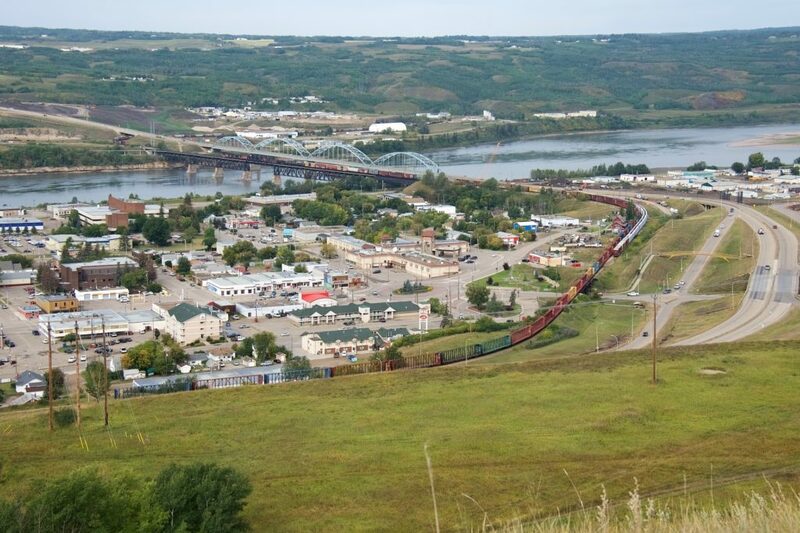 On one side of Peace River, the town, the grade is seven and a half miles in length and with curves. The tracks pass before the depot, then cross the river and climb a grade a mile and a half in length on the other side. AT THAT TIME both railway and highway, such as it was, shared the bridge to cross the river. Today there is a bridge for each. On the day the funny thing happened to the caboose, a freight pulled into a passing track at the top of the longer grade. The crew cut off the caboose while the train was moving and the van, as they are also called, stopped foul of the main line. The crew endeavoured to push the caboose the few feet to clear the passing track. When this becomes an effort that could be described as a bit much, they signalled the engineer to give the caboose a gentle nudge. The caboose, freed of mama’s stout apron strings from which it had been tagging everywhere, took the nudge as an invitation to romp in a playground created by the two grades and containing but one great toy, a gigantic teeter-totter. THE CREW WAS on the ground when the caboose took off. Some engaged in an exercise of futility by running after it. The thing covered the seven and a half miles in seven minutes and screamed past the depot at 7:50 o’clock of an otherwise pleasant morning. C.J. Swanson, the assistant agent, was preparing for his trick at the telegraph tables when the caboose raced past the depot. The caboose continued on and across the bridge, then part way up the other grade before its momentum was stopped. Fun it was, and the caboose decided to do it again. 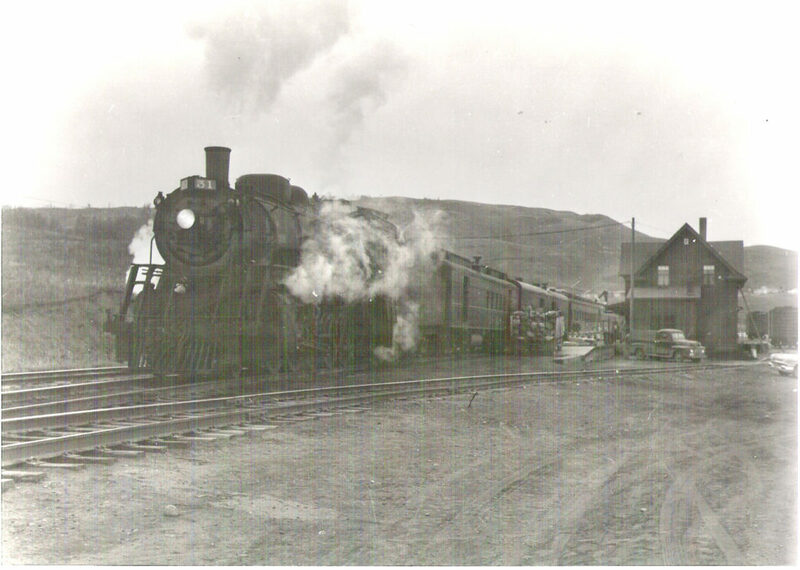 It began a return descent, approached the depot and Mr. Swanson who was standing on the platform with the intention of boarding and stopping it, then hastily changed his mind. THE CABOOSE went part way up the first grade, paused momentarily and then had another go at it. Once more it sped downward toward the depot, bridge and its friend, the other grade. And once again Mr. Swanson decided he wasn’t going to deal himself in on a game where the caboose was wild. The caboose did this for the third time. By then it was beginning to tire. When it passed the depot its speed was about 10 miles an hour. Mr. Swanson boarded it and stopped it by cranking the handbrake as it began crossing the bridge. On the other trips the bridge had been without highway traffic, but on this journey, the bridge was occupied by a wagon and Mr. Swanson stopped the caboose in the face of a startled horse and a more startled milkman. MR. SWANSON entered the caboose to find the interior looked like a giant hand had lifted the car from the tracks, shook it well and put it back. It was 30 below and a merry fire burned in the stove. The only reason the stove stood upright and the caboose was not in ashes for the matter, was the stove was bolted to the floor. But a coal oil lamp had toppled on a bunk mattress. The mattress was smouldering and when Mr. Swanson opened the door it burst into flames. Mr. Swanson dragged it outdoors and tossed it into a snowdrift. The crew came to praise Mr. Swanson and Allah and then came the meditations. How to report the incident when nothing had happened except the lost mattress, and anybody who could not explain the loss of a mattress did not deserve the slightest of intelligence. 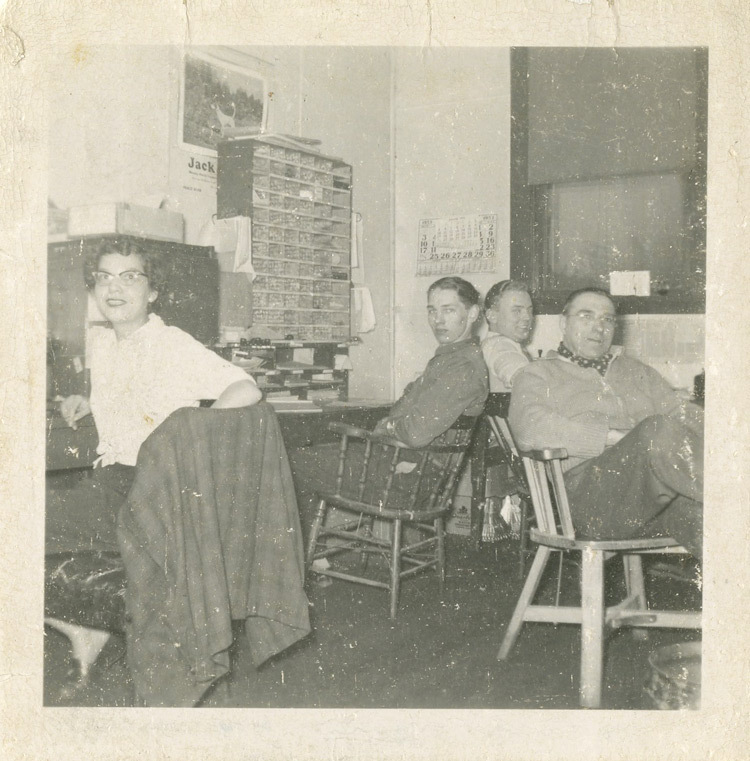 THE INCIDENT would have gone into the passing track of memory had it not been for the lady who sat beside Mr. MacArthur at the board of trade dinner. Mr. MacArthur began an inquiry and answers he was given to assorted questions deserve to be in the archives as examples of man’s ingenuity to come up with good ones, however late. Another said he had felt something should be reported, but with that he allowed his conscience to book off duty. A THIRD SAID that as nobody had been injured or any damage done, he thought that to have reported the incident would only have caused trouble. The conductor was right behind the company. He said a report would have led to publicity, the publicity to criticism of a fine firm and perhaps demands for safety gates and signals on the bridge. All expensive. There were various demerit marks for all the crew for not reporting the incident and extra penalties depending upon whether the individual had tried to stop the caboose or had simply stood about shouting at it. But Mr. Swanson became a difficult problem. He was given 15 merit marks for his valiant performance in boarding and stopping the caboose, dragging out the burning mattress and saving the car from destruction. Then he read the fine print. He was also assessed 10 demerit marks for being a party to not reporting the incident. Material republished with the express permission of: Calgary Herald, a division of Postmedia Network Inc. If you look closely in this photo, you can see the Train Station (built in 1916) to the left of the tracks just as they take a sharp curve to the left to go over the bridge. After this incident came to light and traffic increased, a little house was built on the train bridge where a valuable employee operated traffic arms and turned on the green light for vehicular traffic when there was no train coming, and a red light to help people avoid being startled like the milkman’s horse. 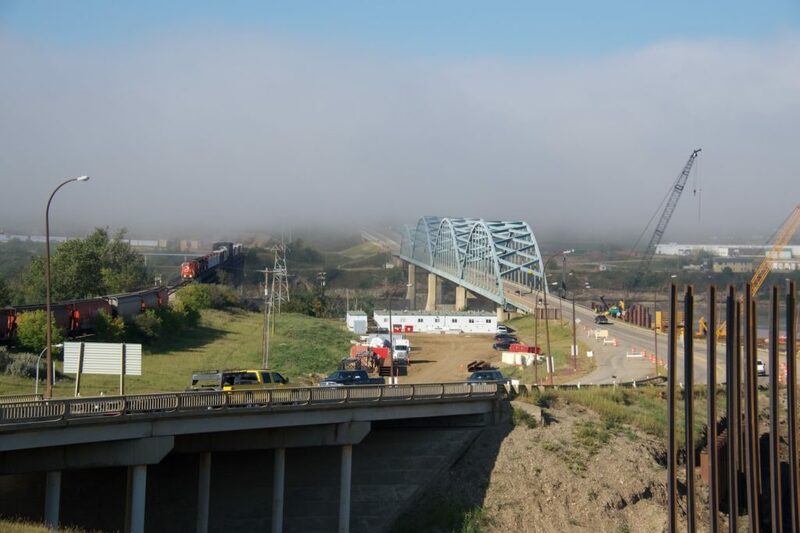 Long-time Peace Country farmer, Bill Veidt, says his wife, Joan, when she was expecting a baby, would hope and pray there would be no train on the bridge when she went into labour as their farm was on the other side of the Peace River from the hospital! I discovered the photo through our son, Denver, who is training as a pilot in the Royal Canadian Air Force. 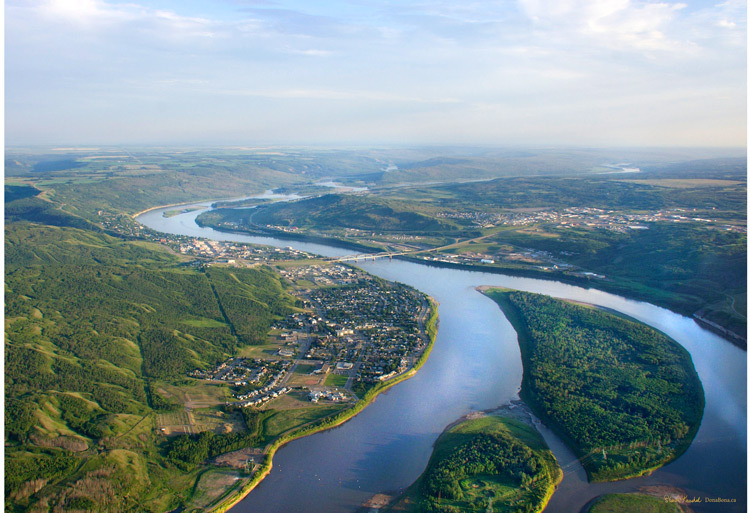 One of the medical technicians helping him overcome airsickness said, “Peace River… I know I’ve never been there, but it sounds so familiar.” She went home to find this photo on her wall. She had seen it at the U of O and thought it was such a cool image, she bought a print and framed it, and she showed it to us when we were visiting Denver in Moose Jaw. If anyone else thinks this is a cool image and would like a print larger than the 5″x7″ card, let me know! 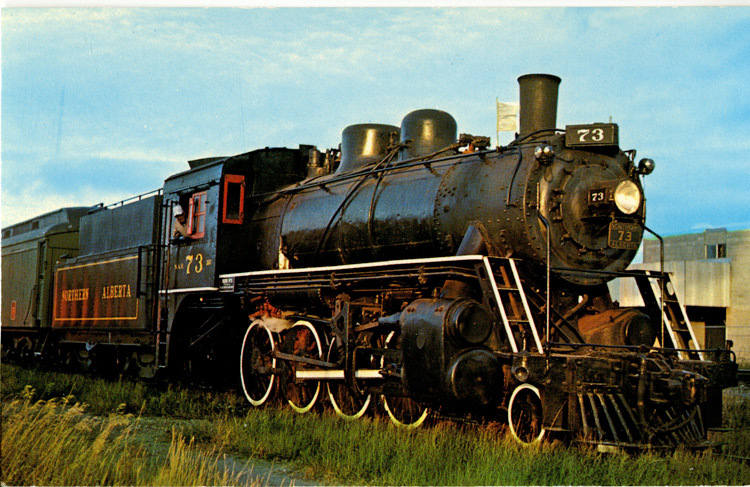 Thank you to the Peace River Museum for the use of the other black and white photos and the colour photo of the #73 train. 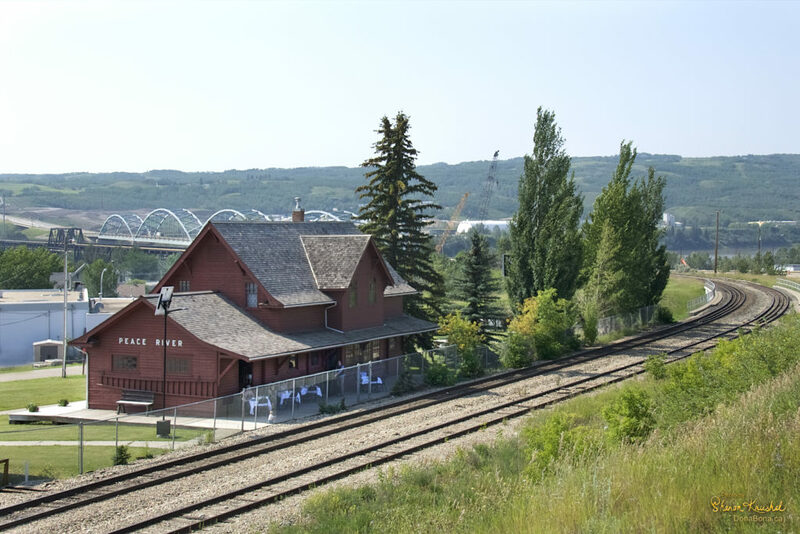 You can read the fascinating history of the 1916 Peace River Train Station and 1918 bridge on the back of the “Peace Train” card, and read about Peace River’s contribution to peace here.